We firmly believe our flexibility is the key to meeting your needs whether it be for a corporate retreat or seminar. 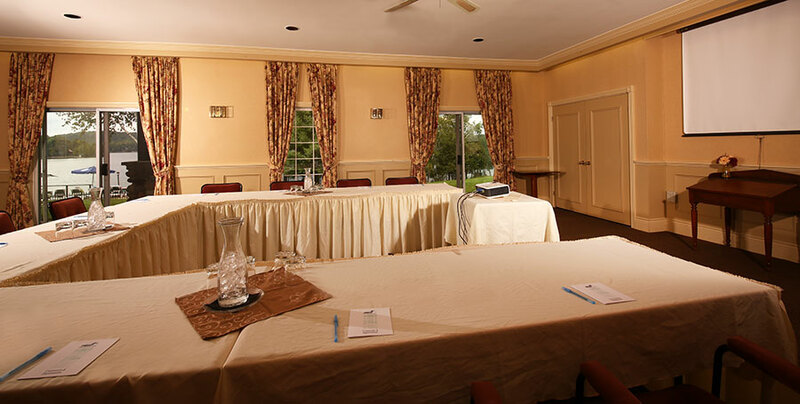 We can happily accommodate your meeting of up to 50 people in our modern conference room. Sir Sam’s specializes in small meetings and conferences. To many we are able to extend exclusive use of the Inn and its facilities, accentuating our high level of privacy and service. The Hughes Conference Wing caters to a wide range of business needs with a full range of audio visual electronics and presentation aids. At Sir Sam’s Inn our guests make the decisions. From menus and dining hours to recreational times and activities. We feel our flexibility is the key to meeting your needs and can comfortably accommodate meetings of up to 50 people in our conference room. Sir Sam’s Conference package – includes three meals daily, coffee breaks, meeting rooms and audio visual equipment as required, plus full use of all recreational facilities. Please call or email the Inn for specific package details. My wife and I are on a road trip though the East coast of Canada and needed a couple of days to recharge our batteries for our anniversary. This place makes you relax, whether you puddle around on the lake on the paddleboards / kayaks or try each of the buttons in the spa pool. They are missing a trick not doing bar food as we were not hungry enough to eat a 3 course meal but we just split it between the two of us and made plans the next night. Check out the night sky late at night . Sir Sam’s was the perfect weekend getaway. The room was perfect and spotless, the staff continued to go out of there way to be hospitable and the food was excellent. I swam in the lake, went for a nice trail run, took out a canoe and a paddle board over the course of my 2 night stay. I noticed others taking advantage of the quiet corners, reading and relaxing. I spoke to a young couple by the fire one evening who did the canopy tour and said it was amazing (something I will check out next fall). I will be returning with my wife annually. Lake view fantastic. Moonlight so bright you could see at night. Menu changed each day. A very enjoyable stay, and canoeing on the lake was the best. Saw a deer by the water and paddled close to loons. Spa was a treat. We are planning to go back. Be the first to hear about exclusive deals and packages from Sir Sam's Inn. Enter your email address below. The pleasures of Sir Sam's Inn & WaterSpa know no season. We invite you to enjoy them all. The warm sunshine of the spring and summer months, our spectacular autumn and the exhilaration of wintertime. © 1998-2016 SIR SAM'S INN | ALL RIGHTS RESERVED.